ShipLogs.com Secure online record storage for your boat. Store your Boat records online! Access your Vessel Records, Anytime, Anywhere with ShipLogs.com! "Prudent record keeping is, within itself, an important maintenance task." ShipLogs.com is designed to simplify that task by providing an organized method of securely storing and retrieving information related to the maintenance and content of marine vessels. You'll be absolutely amazed how simple your record keeping will be with ShipLogs.com. Operating a large vessel is a very complex task. Keeping track of the numerous aspects can be a daunting proposition. Now, ShipLogs.com makes organizing all of your information easy. 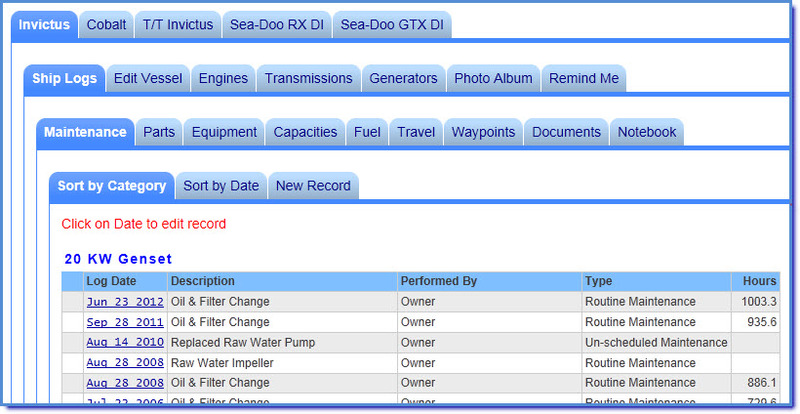 Everything from commonly replaced parts to on board personal property can be logged safely in our remote database. Having a complete inventory of items on your vessel is essential in the unfortunate event of fire, theft or other loss. Additionally, you are afforded the peace of mind that your data is secure in a fully backed-up environment. ShipLogs.com's secure internet based platform allows you to access your records, anytime, anywhere, on any computer, tablet or smart phone with a connection to the internet. "We tried to put a system together for the inventory of spare parts and a maintenance schedule for our boat and found it to be disorganized and cumbersome. Then a friend recommended ShipLogs.com. In no time we had our records transferred to ShipLogs.com. Information on spare parts, part numbers, maintenance records and much more are now at our finger tips. Thanks to the people at ShipLogs.com nothing could be easier." Sign up today and your first month is FREE! If you agree, ShipLogs.com is for you, all of your trial data will be saved and you'll be fully aboard! Your subscription fee notice will be sent automatically but pay only if you're completely satisfied with ShipLogs.com. If you're not completely satisfied with ShipLogs.com, simply ignore your subscription fee notice. Your account will automatically expire and you'll be under no obligation whatsoever. All entered data will be erased. ShipLogs.com is just $9.95* a month billed annually. That's less than $0.33 a day to have all your boating records at your fingertips anywhere you have access to the internet.